This comprehensive study of contemporary flatpicking guitar technique presents numerous solos for the beginning through advanced flatpicking guitarist along with tips on creating your own flatpicking arrangements. The book addresses the tablature system, tuning, right and left-hand technique, use of the capo and the microphone, transposing using the Nashville numbering system, bluegrass back-up, arranging flatpicking solos and instrumentals. 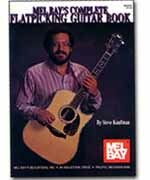 If you're into country or bluegrass music, or if you just want to develop outstanding flatpicking technique, this book is for you. Written in standard notation and tablature. The stereo play-along CD features Steve Kaufman's rousing performance of each flatpicking solo!